Expressions like “mad as a hornet” or “stirring up a hornet’s nest” tell their own unmistakable tale about this stinging insect’s place in modern language. There are about 20 diverse species of hornets. They are classified as predatory wasps, and found primarily in Europe, Asia, Africa and North America. While the later half of Summer is wasp and hornet season, it’s about this time in Spring when the queen emerges from the winter to start building her nest. Their preferred habitats are forests and rural areas and they are sociable insects that live in large, highly organized colonies. Hornets are much larger than other wasps, making them formidable critters to avoid. Their colors are also different, as hornets are more orangey-red than their counterparts, which are usually yellow and black. Hornets often build their nests in high places but they are also known to construct them on the ground in enclosed spaces such as abandoned rodent burrows, which offer both support and security. Usually found near parks and gardens where humans congregate, interactions are inevitable and can be very dangerous if a nest gets stepped on or somehow bumped by accident. This could cause the entire hive to attack and result could be fatal. Read on to learn more about these stinging insects, or contact our team today with any residential or commercial pest-related issues! (412) 252-5200. Hornets have a rich diet of sugar and proteins. They love tree sap, fruits and fizzy drinks. Unfortunately, honeybees are one of their favorite foods as they are a source of protein for their future queens and honey. Due to the fact that the average hornet is almost 5 times larger than the European honeybee, one giant hornet can kill 40 bees within the span of a minute and it takes only a few to wipe out an entire colony. The Japanese honeybees have developed their own survival strategies in dealing with hornet invaders over the last few centuries. When a hornet scout approaches the hive, the bees immediately attack en masse before the insect can call for reinforcements. They swarm around the intruder, vibrating their bodies at an incredible rate of speed, which in turn causes the temperature in the hive to radically soar and roasts the hornet alive. Honeybees from other parts of the world have not yet learned this defense strategy, and they are greatly endangered as hornets cross the globe into newer territories. As is the case with many insects, there is a place within nature’s ecosystem set aside especially for hornets. They crave garden pests as part of their diet, which includes destructive aphids. It is estimated that one worker hornet can collect over 100 aphids a day. Hornets eat plant matter and are also predators of other insects. They can and do cause great damage to fruits, particularly apples, even while the fruit is still on the tree. Orchard workers who pick fruit for customers who patronize farmers’ markets are stung often by hornets and their painful and potentially lethal stings have incited many trips to emergency rooms. This is occurring more and more frequently, and Dr. David Biddinger, an entomologist at the Pennsylvania State Fruit Research and Extension Center in Biglerville, PA, attributes this rise in the massive number of insects present at harvest time to alterations in newer pesticides that are less dangerous to humans and crops, but unfortunately also less lethal to hornets and other wasps. Trust Pestco For Hornet Control! Integrated pest management specialists must be contacted to address a hornet infestation. Stings can be perilous, and do-it-yourself remedies not only do not work, they also often end up being more costly than hiring a professional in the first place in lieu of doctor and emergency room visits. Hornets have their place in nature and the world, albeit they must always be approached gingerly and with utmost caution. Here are seven little known facts about these stinging insects. Hornets release more venom per sting than any other insect and their sheer size makes their stings harmful to humans. Although they are quiet and shy by nature, if disturbed their attack can be fatal because their sting carries five times more venom than the average wasp. They also attack en masse which makes their stinging power both dreaded and lethal. This hornet can reach lengths of up to 2 inches. Originating in Japan, this species is known across Europe. With a long stinger and venom that contains powerful chemicals that wreak havoc to human tissue and nervous systems, these critters are best left alone. Many people in Japan die every year from giant hornet stings. Raw or fried giant hornets are considered among many Japanese to be a delicacy. It is the secretion that is produced by the hornet larvae to attract and energize the worker insects that has become the foundation for a popular Japanese sports drink, which contains synthetic chemicals that are very similar to those found in the natural secretion. Hornet tree top nests are almost always football-shaped. They are mostly found in treetops, under roofs or decks, in sheds or garages, in hollow tree trunks, or in other areas that are raised off the ground. They have a papery texture and are comprised of saliva and chewed wood. When one hornet finds a bee colony it releases pheromones to attract other hornets. Technically, hornets are a breed of social wasps and a distinct division. They belong to the insect family, Vespidae, which contains species of hornets, yellow jackets, paper wasps, potter wasps and pollen wasps. For the more eclectic collector, hornet nests have their own private allure. Nests are engineering masterpieces, lightweight and extremely strong. They have specific sections with rows, which are designated spots for the queen to lay her eggs. Their unique and intricate compositions are a source of endless amazement and study. 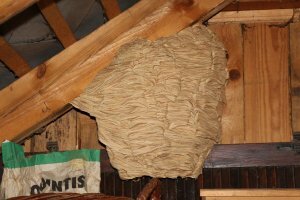 Collecting a hornet’s nest must be done with caution and can only be accomplished long after the insects have left their abode. Residential pest control is just one of our many talents. For businesses throughout all of Greater Pittsburgh, Wester Pennsylvania, Eastern Ohio and the Western Virginia panhandle, our Facility Hygiene Care program is a three-pronged initiative that features pest-control and pest-management services provided by Pestco, ambient air-care and air-freshening products supplied by Air-Scent and superior restroom hygiene services conducted by Enviro-Master. Commercial space owners should take advantage of this special offer and strive to become pest-free settings with clean, pleasant-smelling restrooms for both visiting friends, relatives, customers and employees. Submit your facility particulars or call to find out more about this bundled program today (412) 252-5200!